Thousands of people have fled violence in northern Nigeria and crossed into neighbouring Niger following fighting between the security forces and armed groups in north-eastern Nigeria, close to the border with Niger. Images and soundbites of relief operations in various areas in Niger. A young teenager dashed across a runway at a Nigerian airport, hid in the wheel well of a jet and survived a 35-minute domestic flight, the airline and aviation authorities said Sunday. Passengers and crew had alerted the pilots that a boy was seen running to the plane as it was taxiing to take off Saturday from southern Benin City, Arik Airline spokesman Ola Adebanji said. The pilots alerted the country's aviation agency, he said. The incident highlighted the growing concerns about airport security in Nigeria, which is fighting an Islamic uprising mainly contained in the northeast of the country, where there is a state of emergency. "We are worried by the incessant security lapses at our airports," Arik Airline managing director Chris Ndulue said. The West African country also has a history of major aviation disasters and security challenges. Despite the possible presence of the boy, the pilots opted to continue with their takeoff, Federal Aviation Agency of Nigeria spokesman Yakubu Dati said. "Immediately upon the departure of the aircraft, FAAN's security did another sweep of the area and found nothing unusual," Dati said. 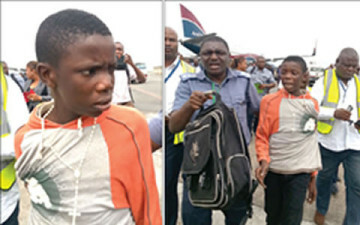 When the plane arrived in Lagos, Nigeria's commercial capital, a boy aged 13 or 14 jumped to the ground from the wheel and was detained by Arik personnel, Adebanji said. He said the teenager probably survived because the flight was short and the plane probably didn't rise above 25,000 feet (7,620 meters). Most stowaways don't survive. The body of a suspected stowaway fell from an Air France plane over Niger, also in West Africa, in July and was discovered lifeless in a western suburb of the capital, Niamey, officials said. The plane was coming from Burkina Faso's capital, Ouagadougou, and was scheduled to continue to Paris. In September 2012, a man's body landed in a street in southwest London. He was eventually identified as Jose Matada, 26, of Mozambique, who an employer said had expressed an interest in moving to Europe for a better life. Police thought at first he was a murder victim, but soon determined his lifeless body had fallen from a plane preparing to land at nearby Heathrow Airport. Last year, Nigeria gained a coveted U.S. safety status that allows its domestic carriers to fly directly to the U.S.
Health services are to be paralysed indefinitely in public institutions throughout the country as the workers have been ordered to down tools from today. The Joint Health Sectors Unions (JOHASU) gave the directive Tuesday following the expiration of a 21-day ultimatum given to the government on August 1 and the failure of the Minister of Labour or his representative to turn up for a meeting scheduled for Monday to amicably resolve the issues in dispute. This information was contained in a statement made available to journalists Tuesday in Abuja and signed by the National President and Secretary-General, Medical and Health Workers Union of Nigeria (MHWUN), Ayuba Wabba and Marcus Omokhuale respectively, their counterparts in the National Association of Nurses and Midwives (NANNM), A.A. Adeniji and W.G. Yusuf-Badmus; Nigerian Union of Pharmacists, Medical Technologists and Professions Allied to Medicine (NUPMTPAM), Faniran Olukayode and M.O. Akinade. The other signatories are Mrs Ladi Iliya and Peters Adeyemi of Non-Academic Staff Union of Educational and Associated Institutions (NASU) and acting President and General Secretary of Senior Staff Association of Universities, Teaching Hospitals. Research Institutes and Associated Institutions (SSAUTHRIAI), B. Akinola and M.O. Akinade respectively. The associations said the industrial action, which is to affect federal tertiary health institutions from today, will be joined by workers in states and local government health institutions from midnight on 28 August. “While we sincerely apologise for the inconveniences this action may cause Nigerian citizens, the Minister of Health, Prof. Onyebuchi Chukwu, should be held responsible,” they said. The issues for which the workers are agitating are non-skipping of salary grade level CONHESS 10; the National Health Bill; consultancyand specialist allowances as well as Call/shift duty and other professional allowances. However, after 13 months of adjudication, the National Industrial Court ruled on July 22, that the skipping of CONHESS 10 was legal and that the purported circular by the Ministry of Health and Head of Service of the Federation stopping it was illegal, null and void and of no effect. JOHESU argued that the import of the ruling was that members would continue to skip CONHESS 10; that those earlier appointed as consultants would continue to enjoy the status along with other benefits and that the withdrawal of their letters of appointment was irregular. Further, the group contended that shift duty, administrative non-clinical and call duty allowances should remain as they are but that negotiation should commence towards a review of the allowances. “Also, it was held by the court that issues already agreed upon are accrued rights and should be implemented without delay in line with collective bargaining agreement,” they said. The leader of the armed group Boko Haram, Abubakar Shekau, may have died of gunshot wounds some weeks after a clash with soldiers, the Nigerian military has said. In 2008, Abasiama Idaresit returned to Nigeria, after studying for a degree in Information Systems & Management at the London School of Economics. He had one thing in mind: to see how the Internet could help transform the business landscape in Nigeria. That, in fact, was the focus of his dissertation -- the impact of technology on small businesses. But Abas kept at his proselytising. Abas tried to convince Baby M's proprietor to give him a chance to show how the Internet could help her advertise cheaply and find new customers. At first she wasn't very keen. Until Abas offered a money-back guarantee in the event that he failed to fulfil his promise. With nothing to lose, she gave him N40,000 (approx $250) -- his debut earning as an internet marketing consultant. The results were phenomenal. Within three months, says Abas, Baby M's revenues grew from $1,000 a month to $100,000 a month, immediately overwhelming her capacity to fulfil orders. Shortly after, Abas incorporated Wild Fusion, to do for other businesses what he'd done with Baby M.
Wild Fusion has since grown remarkably, from its founder's first $250, to over a million dollars in revenue in 2012. It is now on course to double that, in 2013. While global corporate spending on traditional mediums (TV, radio, print) has either declined or stagnated in the last few years, Internet advertising budgets have steadily grown, and will continue to, into the near future. The shift is beginning to be noticeable in Nigeria, and everyone -- from banks to beer companies -- is now seeking to actively engage consumers on the Internet. According to the International Telecommunications Union (ITU), Africa's 27 per cent average annual growth (2009 - 2013) in household Internet penetration is almost double that of the next fastest contender, Asia and the Pacific. Africa is also the world's fastest growing market for mobile broadband. Tens of thousands of people have been threatened with being made homeless in Nigeria, as the government plans to replace shanty homes in the capital Lagos with new and improved houses.They fear they will be evicted and cannot afford to live in the new buildings. Human rights group have criticised the government's plans, saying authorities have the obligation to prevent forced evictions. Uche Nwafor scored two second- half goals to earn Nigeria a comfortable 2-0 win over hosts South Africa in a friendly international at the Moses Mabhida Stadium on Wednesday. Nigeria were back in the country where they won the African Nations Cup this year and Dutch-based striker Nwafor, playing only his second international, scored with an audacious back heel to give the visitors the lead in the 49th minute. Nwofor reacted quickest with his back to goal and improvised with some power to beat South Africa goalkeeper Itumeleng Khune. He got his second goal in the 68th minute at the end of an swift passing movement involving Victor Moses and Ahmed Musa, whose quick movement cut through the home defence to set up an easy tap-in for the VVV Venlo forward. Moses and Russian-based Musa were brought on at the start of the second half to inject more pace into the Nigeria attack. "I knew the South Africans were planning on them starting so I kept them for an impact in the second half," coach Stephen Keshi told reporters. South Africa created several chances but were let down by poor shooting, particularly after making space for themselves on the edge of the Nigeria box. It was a sixth loss in eight outings for Bafana Bafana against the African champions, whose next assignment is a key World Cup qualifier against Malawi next month. Nigeria need only draw on Sept. 7 at home in Calabar to win their group and qualify for the final round of African qualifiers. "We need to get more rhythm and work more on our possession and tactical play. If we get that right and the attitude is there, we can progress," Keshi told a news conference. Nigeria has become the first Africa country to sign and ratify the Arms Trade Treaty (ATT), the Minister of Foreign Affairs, Olugbenga Ashiru, has disclosed. "Nigeria becomes the first African country to sign and ratify the Arms Trade Treaty (ATT). "This landmark event represents our deep commitment to a treaty which establishes common international standards for the import, export and transfer of conventional arms. "We remain resolute and unyielding in our efforts to uphold the principle of ATT and, in particular, ensure that small arms and light weapons are appropriately transferred and access denied to terrorist groups, pirates, bandits and the like," Mr. Ashiru said while signing the treaty. He noted that Nigeria co-sponsored the treaty and coordinated the African group throughout the process of negotiation of the treaty. According to the minister, the adoption of the treaty was a realisation of efforts that started in 2006, following the adoption of the United Nations resolution 61/89. Mr. Ashiru explained that the resolution recommended the establishment of common international standards for the import, export and transfer of conventional arms. The spokesperson for Control Arms, Anna Macdonald, in her remarks at the event, noted that throughout the negotiations on the ATT, Nigeria was a leader for the African continent. "We are proud of Nigeria's leadership again today as Foreign Minister Olugbenga Ashiru simultaneously signs and ratifies this first ever global agreement regulating the transfer of arms and ammunition. "Africa has long suffered the impact of an arms trade that is out of control. From Somalia to Mali to the DRC, weapons have been entering conflict zones and increasing the level of violence for decades. "Other African countries must now step forward and follow Nigeria's lead. The continent needs an ATT that is in effect and implemented as soon as possible. "With over 80 countries' signatures and several ratifications since the treaty opened for signature, there is momentum to urgently ensure the ATT becomes international law and starts saving lives. "Fifty ratifications are needed for the treaty to enter into force, and we call on all states to get to work on their national legislation as soon as possible," she said. Despite the assurance by the federal government that it is winning the war against terrorism and has successfully dislodged members of the outlawed terrorist sect Boko Haram, 60 persons were killed by assailants suspected to be members of the Islamist group at the weekend in villages in Borno State. The attacks, which also led to scores of others being injured, occurred between Saturday and Sunday in Ngom, Maisarmari and Mailari in Konduga and Mafa Local Government Areas of the state. The rising spate of attacks, especially in Borno and Yobe States, may have formed the main item on the agenda during a meeting yesterday between President Goodluck Jonathan and some service chiefs and members of the cabinet behind closed doors. In attendance at the meeting were the National Security Adviser (NSA), Col. Sambo Dasuki (rtd); Minister of State for Defence, Mrs Olusola Obada; Minister of Police Affairs, Navy Captain Caleb Olubolade (rtd); Secretary to the Government of the Federation, Anyim Pius Anyim; Chief of Army Staff, Lt-General Azubike Ihejirika; Chief of Naval Staff, Vice Admiral Dele Ezeoba; Inspector General of Police, Mohammed Abubakar; and the Director-General of State Security Service (SSS) Ita Ekpeyong. At the end of the meeting, none of the attendees disclosed what was discussed. On the attacks on the Borno communities at the weekend, it was gathered that the sect members were enraged that some residents had been giving out information to the military that had led to the casualties within the Islamist group. A source told journalists in Maiduguri yesterday that not less that 52 villagers were killed between Saturday and Sunday in Mafa and Konduga Local Government Areas. At Ngom village, a border town between Mafa and Konduga, insurgents invaded the village and shot 12 persons dead on Saturday night. A politician from the area, who confirmed the death of 12 villagers to journalists, said he learnt of another attack in Konduga where 40 persons were shot dead. He said there were numerous persons injured in the attacks on the villages, with those who suffered severe injuries taken to hospitals in Maiduguri for treatment. An official at the University of Maiduguri Teaching Hospital, who spoke off the record to journalists, confirmed that 26 persons who were brought to the hospital on Sunday were still at the hospital yesterday receiving treatment from gunshot wounds. Boko Haram members had in the past launched attacks and killed villagers whom they accused of being informants to security agencies and youth vigilante groups who have hunted them down. Last month alone, 45 villagers were said to have been killed in two separate villages in Borno State. Another source told journalists that during the weekend attacks on the villages, there was no gunfire, insisting that members of the outlawed sect members attacked the three villages, killing 31 people, by slitting their throats in their houses and mosques. He noted that the strategy must have been used in order not to attract the attention of security agents during the attacks. A source with the Joint Task Force (JTF) also revealed yesterday that 12 persons were killed at Ngom while 19 other villagers’ throats were slit in surrounding villages on Sunday. He said the killings compelled the task force to cordon off the road leading to Dikwa for several hours. On the Ngom casualties, the JTF source revealed: “I cannot tell you details of the attacks, but it was certain that gunmen in military and police uniforms attacked Ngom village, 20 kilometres east of Maiduguri, the state capital. The incident occurred in the early hours of Saturday, before we were alerted on the village attacks and killings. At the time of filing this report, no official statement had been obtained from JTF, as attempts to get its spokesman, Lt. Col. Sagir Musa, proved abortive. In the meantime, the self-acclaimed leader of the sect, Abubakar Shekau, yesterday claimed responsibility for the recent attacks on some towns in both Borno and Yobe States. Shekau, in a Sallah message to his followers while accepting responsibility for the attacks on Bama, Mallam Fatori, Gomboru-Ngala (in Borno) and Damaturu (in Yobe), said the military was being deceptive over its campaign winning against the terrorist group. The leader of the sect, who also said his group was responsible for the killing of people in Biu, promised to continue on the killing spree until Borno, Yobe and the rest of Northern Nigeria is Islamised, even as he insisted that he was engaged in a war that victory was already assured as the war is holy and supported by God. He boasted that the sect was too much for the Nigeria government to handle and even with the assistance of America and France, it was not a “winnable war” since it is a battle with God. Shekau accused the JTF of merely gathering weapons and showcasing them to having been recovered from the sect, stressing that the military has not recovered anything from them and the sect was waxing stronger. The sect leader stated that the military was deceiving people by saying they had finished with them, adding that members of the sect are still alive. He called on people to join the sect and shun democracy and western education for Islam and the course of the Jihad. He said: “The military is lying to the world about the battle we had with them; they lied that they had killed our members, but we are the ones that have killed the soldiers. “We call on you all to repent and come to the ways of Allah. Forget about constitution and accept Shariah. We don’t have socialism, we don't know communism, we don’t want federalism, but we are Muslims. “You soldiers have claimed that you are powerful, that we have been defeated, that we are mad people; but how can a mad man successfully coordinate recent attacks in Gamboru, in Malumfatori, slaughter people in Biu, kill in Gwoza and in Bama where soldiers fled under our heavy fire power. “We have killed countless soldiers and we are going to kill more. Our strength and firepower has surpassed that of Nigeria. Nigeria is no longer a big deal as far as we are concerned. We can now comfortably confront the United States of America. “Let the world know that we have been enjoined by Allah to kill the unbelievers just like how we were enjoined to slaughter rams during Eid-el Kabir. “And we shall continue to kill those who strive to stand against the will of Allah by opposing Sharia. We don't mind if we die doing this because it is even a blessing for us to die in this cause and gain paradise. So we are winning on either side. In a related development, it has emerged that 20 soldiers went missing following the August 4 attacks on two military camps in Mallam Fatori. The online news medium, Premium Times, quoted military sources as stating that the attackers, suspected to be members of Boko Haram, arrived the Section Four camp manned by the Multinational Joint Task Force (MNJTF) at about 5.30 am that day and took the soldiers by surprise. “The insurgents came around 5.30 am, surrounded the camp and launched a surprise attack on the camp which gave them an edge over us. Our men were caught off-guard,” one of the sources said. He added that as a result of the surprise attack, the Boko Haram insurgents overwhelmed the units they met on the ground and some of the soldiers were chased as far as Niger Republic. Sources also said the soldiers were also surprised by the firepower of the attackers who reportedly also took away with them some weapons from the camp. They however said members of the MNJTF later re-grouped and took back one of the camps, adding however that “the insurgents are still in control of one of the camps”. THISDAY sources said because of the fear of ambush, soldiers on the ground were yet to launch a rescue mission for the over 20 missing soldiers who are still missing with their weapons. The authorities have simply declared them “missing in action,” another source said. “But there is apprehension that the men have been killed,” he added. Shortly after the attack, the JTF in Maiduguri issued a statement claiming that only two soldiers and a policeman were killed in the attack. However, the JTF commander in the state, Major General Jah Ewansiah, reportedly informed the Borno State Governor, Kashim Shettima, when he visited the JTF headquarters on a condolence visit that 12 soldiers were killed in the attack. Human rights campaigners are calling for the Nigerian government to create a minimum age for marriage for women. In local law, once a girl is married, she is legally considered an adult, regardless of her age. The federal government announced yesterday that it had shortlisted 386 firms for power plants across the country. This is just as Vice President Namadi Sambo assured that by 2016, power generation would hit 20,000mw, even as he urged all Nigerians to support the government's transformation agenda. Benue State Governor Gabriel Suswam disclosed this while briefing State House correspondents after the second joint meeting of the Niger Delta Power Holding Company (NDPHC) and the National Council on Privatisation (NCP) at the Presidential Villa. He said a total of 110 submissions were received from those interested in 10 power plants from which the joint evaluation committee endorsed 82 submissions, bringing the number to 386 expressions of interest in the various plants. "We have about 46 consortia and were shortlisted for Bariam Power Plant, 44 for Benin Power Plant, 42 for Omotosho, 41 for Egbema, 41 for Omoku, 39 for Geregu, 37 for Calabar and 36 for Ogwurode, 30 for Olaojeand 30 for Oloronshogo, amounting to 386," the governor stated. Suswam explained that there was need for the Ministry of Power to create the awareness that Nigerians were the ones to tackle pipeline vandalisation because "electricity is not Jonathan's electricity; it is meant for Nigerians. So, if you are sabotaging it, you are not sabotaging the federal government - you are sabotaging the entire Nigerians." According to Suswam, "The reason for people to carry out this act of vandalism is within them, because it is something that is beyond explanation. Some people try to vandalize for all kinds of reasons; why they engage in this act of sabotage. I agree with you that many serious arrests have been made, just like the issue of crude oil theft that is going on in this country. I think the seriousness given to this by the federal government to make sure that they arrest whoever that is involved in this act of sabotage is something that should give comfort to Nigerians. "Otherwise, the efforts and the huge amount of money being expended by government to ensure Nigerians enjoy constant supply of electricity is being sabotaged by some unknown individuals whose motivation is actually not known to anybody, except to say that this is an act of madness, otherwise any reasonable person should rejoice at the fact that the things that are given to Nigerians should be protected by all Nigerians . That is a challenge to the minister, to ensure Nigerians are sensitized and be more conscious of the fact that this electricity is not Jonathan's electricity; it is electricity meant for Nigerians. So if you are sabotaging it, you are not sabotaging the federal government; you are sabotaging the entire Nigerians". For his part, the Minister of Power, Professor Chinedu Nebo, noted that the vandalisation of gas pipelines was politically motivated and disclosed that 460 megawatts of electricity was lost to the low water level of Kainji, Shiroro and Jeba dams. The minister said, "I think it is instructive for the entire populace to know what has been happening recently. It is no news now that a couple of months ago, the western axis of the gas pipeline leading to the power plants in the west were cannibalized, resulting in very severe damage that caused a sharp drop in power supply. That is since being addressed and the damages are being repaired." "Unfortunately a couple of weeks ago the Akoloma plant in the Easton axis was also vandalized, the damages as quiet extensive, but a crack team of experts went to work and restored it bringing out gas supply. And ensured that the shut down axis was open and then the Afam both four and six were onboard again. "But unfortunately when people were rejoicing in parts of the country where power supply was stabilizing another sabtage was discovered a few day ago and Akoloma was also vandalized bt right now it also been addressed and it is hoped that as they finish the evacuation of the condensed stage that they will start pumping gas and we are hoping that the plant in Afam will be back running in a few days time. These are the reasons in aaddition to the fact that water level in Kainji, Shiroro and Jebba are quiet low right now and the water level needs to be properly managed so that the plants will operate optimally." The film adaptation of the critically acclaimed novel Half of the Yellow Sun, written by Chimamanda Ngozi Adichie, will be premiering at this year's Toronto International Film Festival.